We are delighted to announce the date of the annual North-West Brides Bridal Fair in association with the Fermanagh Herald as Sunday 16th September 2018. The event will take place in the Lakeland Forum, Enniskillen and will once again bring the world of weddings to prospective brides and grooms, all under one roof. How will the Bridal Fair be promoted? We make it our priority to promote this event across the North-West to ensure it is a successful event for all. We target brides and grooms using a multi media promotional campaign, Check out examples below. Each exhibitor is assigned a trestle table, chairs and has access to power. You will select your stand location at the time of booking (see floor plan below). A photographer from North-West Brides/Fermanagh Herald will photograph various parts of the Bridal Fair and a selection will be used in a post event piece in paper & online. Who attends this Bridal Fair? All sizes of businesses are welcome to attend from all aspects of wedding planning; from reception venues to bridal boutiques, cake makers to bands and everything in between. With space for 50 exhibitors this is an event not to be missed. * Please note: Space in each category is limited to offer exhibitors exceptional value for money. Book now to avoid disappointment. And finally good old ‘word of mouth’! If you have any design requirements and are looking for a competitive price on leaflets, business cards, pop-up banners or indeed website development, give us a call and our in-house designers can assist T: 028 8241 5009. The Bridal Fair is held in conjunction with the publication of a special Bridal Feature. This Feature will be in the Fermanagh Herald the week leading up to the event. The event is taking place in the spacious Lakeland Forum, Enniskillen. The exhibition space provides a light and airy space, perfect for showcasing your goods and services. 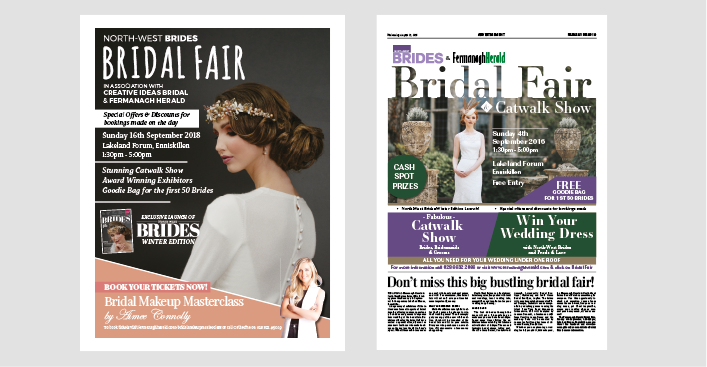 Businesses have the opportunity to exhibit at the show and/or take out advertising in our Bridal Supplement. All stands include a trestle table, chairs, access to power (if required). Payment is required to secure your stand. 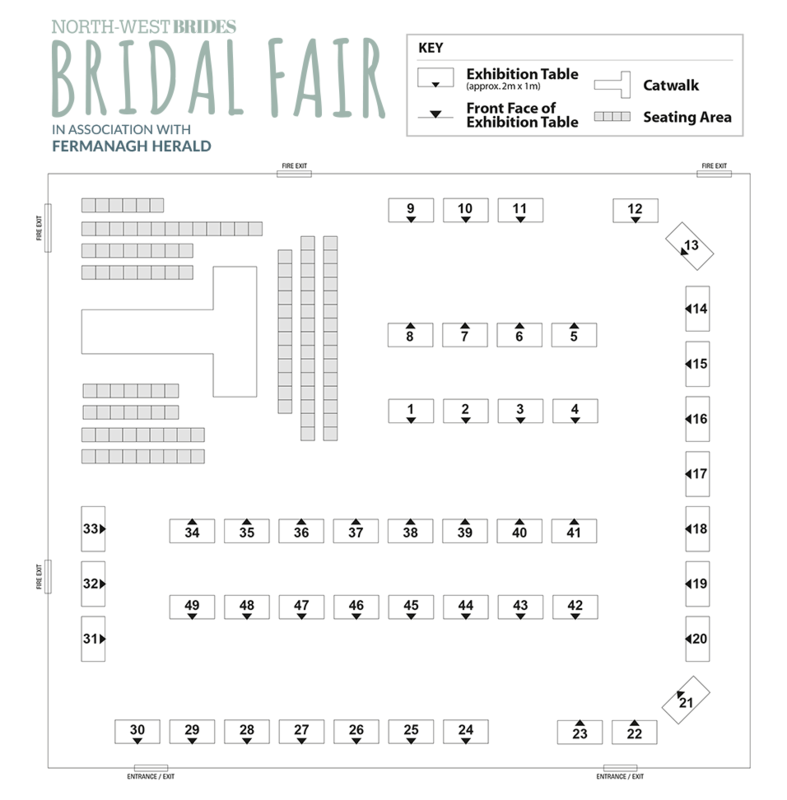 To book your exhibition space and/or advertise in our dedicated Bridal Feature fill in the booking form below or contact Catherine on 028 8241 5009 or email c.cassidy@northwestnewsgroup.com. What competition/discount are you likely to provide? Other requests: Please list any other needs such as a position in front of a wall, extra chairs etc. I accept that full payment must be received before Friday 30th August 2019. Please tick here if you agree to the Fermanagh Herald contacting you with business related offers, events and news.